At The Economy's Bottom Rungs, Striving To Climb Up In the last of a three-part series, All Things Considered talks with several North Carolinians who are living in poverty, but aspire to the middle class. Hard work is key to a better life, they say — but it's not easy to keep moving up the ladder. All Things Considered host Robert Siegel talks to North Carolinians about their economic station. As the presidential campaign has unfolded, the candidates have traded polemics about wealth, class warfare, taxes, dependency and the role of government. While it may be uncomfortable to admit, some Americans are simply more financially successful than others. But why do some achieve wealth, while others struggle? Why does one woman make it to the executive suite, while another man drives a taxi? And what do we think explains our prosperity — or lack thereof? All Things Considered host Robert Siegel visited North Carolina's Research Triangle area to ask people from very different walks of life how they account for their economic station in life. In the final installment of the series, we talk with several people who are on some of the lowest rungs of the economic ladder — but are working hard to move up. The child of a farmworker, Yesenia Cuello aspires to become a nurse. She supports herself through school by working at McDonalds. At a board meeting of NC Field, a North Carolina nonprofit that serves farm workers, a consultant with a flip chart is going over budget assumptions and fundraising goals. Yesenia Cuello, president of the organization's youth group, is here. Cuello, 20, was born in Los Angeles, but lives in the tiny town of Pink Hill, N.C. Her Mexican-born mother, who is single, moved east and brought the kids with her. "There was four of us at the time," Cuello tells All Things Considered host Robert Siegel. "Right now there are six, so my mom was mother and father for all six of us." Cuello's mother, her brother and a sister all work in the fields. Cuello herself was picking tobacco at age 14. "It's mostly bending down," she says. "The heat is what's tough." Cuello says the wages, about $7.25 an hour, keep her siblings going back to farm work. But she's not going to join them, she says. "When I was working there, I was like, this is not what I'm going to be doing for the rest of my life." Instead, Cuello is pursuing a nursing assistant certificate. She hopes to finish college and become an RN. She supports herself by working about 30 hours a week at McDonalds. Cuello figures she can make about $12,000 a year at that rate. She says she believes in hard work, family and education, and that prayer helps her relax. But she also cites one key decision that accounts for her current upward mobility away from the farm-working life: Unlike many of her peers, Cuello is childless. "I'm not ready for that," she says. "All that comes later." Cuello doesn't think luck has much to do with her current economic situation — or her drive to leave farm work behind. But she does believe in working hard to get ahead. "I don't think that somebody's academically gifted," she says. "It's all based on, I believe, studying and work. I did a whole lot of studying. ... I believe it's just a whole lot of studying and memorizing stuff that gets you where you are." Cuello says government programs have been an important source of support for her and her family. "My mother received food stamps and we get Medicaid. ... They're a lot of help," she says, along with free school lunch, training in English as a second language, and her public school education. Oscar Chairez, 20, has also had the benefit of a public education. Born in Mexico, his mother brought him to Clayton, N.C., when he was 3. He's lived in this town, about 16 miles southeast of Raleigh, ever since. After high school, Chairez got a full-time job at the factory where his mother swept floors; he even became a supervisor. All was going well until earlier this year, when he says Homeland Security officials came to the plant and checked Social Security numbers. He and his mother, both undocumented, lost their jobs. Chairez, single and without kids, is trying to stay in the country under Deferred Action for Childhood Arrivals, the new program that enables some undocumented immigrants who came here as children to remain. A part-time college student, he says he has no financial aid for school. Chairez says he's making about $15,000 a year with part-time work, presumably being paid by someone off the books. Chairez says he's in a bad way, but that other young people are a lot worse off. "I know of people younger than I am [who] have to work jobs not to support themselves, but to support their family," he says. "Their mother might be unemployed, and he might have or she might have three or four more younger brothers and sisters." Chairez says his own siblings — all citizens — live with his mother, and "they're making ends meet." When it comes to his own financial situation, Chairez says he feels he's doing "a whole lot better than a lot of other people ... because of hard work. And if I'm still not as far ahead as I want to be, it's because I haven't worked hard enough." When asked if intelligence plays a role in where he is today, Chairez says, "I consider myself smarter than the average bear, and I look at where I am and what I can do with my own hands ... there are other people who aren't quite as academically gifted as I am, and I kinda know that they've got a hard road ahead of them." And where does luck come in? "I can probably take a few of the other factors, such as hard work and brains, and make my own luck," Chairez says. Johnita Ellerby is also struggling to leave poverty behind. Ellerby, 35, is a single mom with four children. They live in Sanford, N.C., where she works full time as a certified nursing assistant while also attending college for social work on a scholarship. Ellerby is getting by, but she also lives with fear that the gains she's making could slip away. "I still have that uncertainty, about what could happen if my scholarships stop," she says. "Sometimes I get scared, sometimes I get afraid ... how long can I do it, how long will the safety net be there for me." 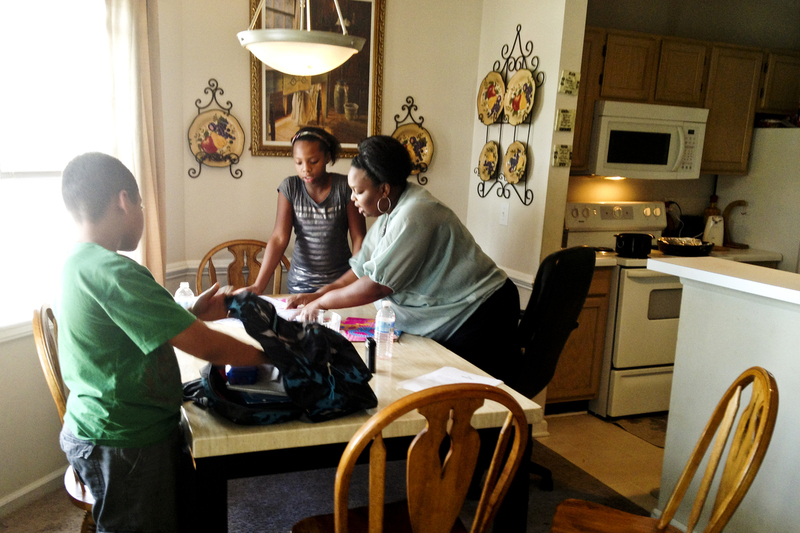 Johnita Ellerby, a single mother of four, is studying social work while working full time. 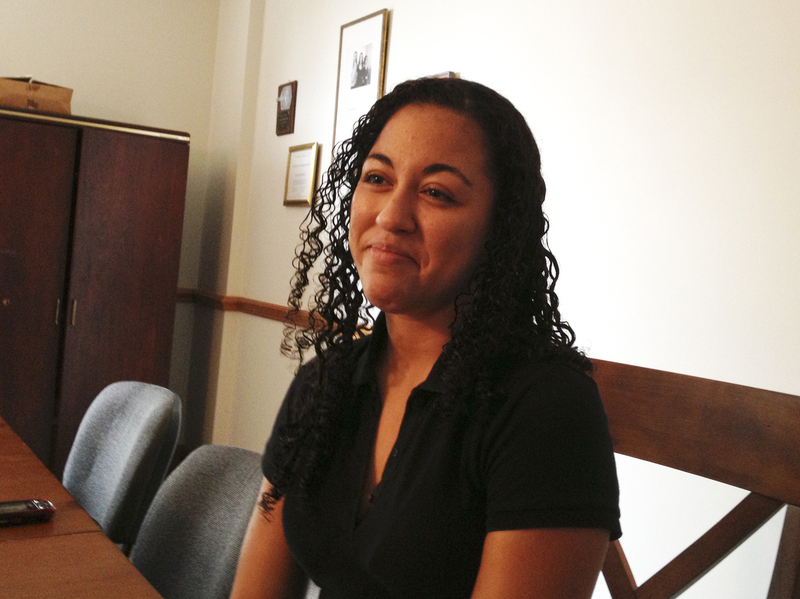 She fears her progress could be erased if she loses her scholarship. Ellerby grew up poor, black and religious. Hers was a loving family, she recalls, but she also says she was molested by a male relative as a child — and later abused by a husband. Unlike Cuello, Ellerby thought the way out of poverty was to have children — not put them off. She had her first child when she was 16. And while she knew she was smart, she feels having a child altered others' expectations of her. "Teachers would often tell me I was smart — would often even find out that I was in the wrong classes, I should have been in higher classes," Ellerby says. "But I think the fact that I had a child, no one took the time to say, 'OK, well, you can still go to college anyway.' "
Ellerby says support from her community plays a tremendous role in her current station in life — and her efforts to transcend her economic status. "My friends and my family ... support my journey with my education," she says. "You know, offering something like a bag of groceries, a jug of milk. Offering to watch my kids while I work a 16-hour shift." That kind of help, Ellerby says, "has been the way I've been able to survive." Ellerby also gives special credit to an act of philanthropy. To go to college and live in the community where she does — as opposed to the gang-infested part of Sanford where she once lived — her rent and scholarship are paid by Doris Buffet's Sunshine Lady Foundation. Ellerby says her kids give her great joy — and the philanthropic support she's received, she says, means her children are starting out in a much better place than she did.